At our camp, our Leader In Training (LIT) program has transformed into something that really impacts the lives of our 15-year-olds. It’s a full immersion program, tight-knit…family-like. The program gets teens to become more service-minded, from community projects to helping their peers. We also offer a Waterfront Lifeguarding course for any LIT interested, as well as a CPR certification. We emphasize in the program that leadership means putting others before yourself, and that a strong moral compass is crucial if you want to inspire greatness in others…That sometimes you may get tired of being a leader, but you can’t take the “role model” shirt off once you put it on, or you’ll lose the respect of those following you…That people look up to you as a leader because of your character, not because of those awesome Abercrombie jeans. Success can be hard to measure when working to better others’ lives, as many people lose contact once they leave their experience with us, and we’re left to wonder – how is so-and-so doing? Are they still on the right path to a good education? A fit and healthy life? To becoming an outstanding community member? “Tony, my name is Kevin. And you may not remember me, but I was in the LIT program in 2010.” The young man went on to express his gratitude for everything the program taught him. He is now guarding 20+ hours a week, on top of his high school education. In the summer, he switches venues and works as a guard at the local town beach, providing a safe and fun environment for kids, and yet another opportunity for the local youth to learn how to swim. Kevin went on to cite the LIT program for helping him to become driven to work within his community in a way that helps others…and he was most appreciative that he was able to get his certification to allow him to have such a job. He shared with Tony that he is currently applying to colleges, and is looking forward to extending his education, and becoming an active member of a new community. Our executive has always said that the primary role of a leader is to foster and develop more leaders. As I thought about Kevin’s story, and put aside the warm-fuzzies it gave me, I really was able to reflect on the magnitude of the work that we do as a YMCA…and the potential for more. Kevin was truly impacted by our leadership program, which I can only assume is due to the emphasis of values and integrity, and the program’s staff, who are skilled at leadership by example. Our teens look up to their directors, and aspire to be like them…to be solid, good individuals. And now, Kevin is bringing the skills and character that he developed with us to another YMCA, and into his community. We can acheive so much by walking the walk – not just talking about the keys to leadership, but truly incorporating them into EVERY interaction we face – with co-workers, members, family, friends…even the general public. We need to cross check every action or conversation we engage in with the values and areas of focus we preach. Just by showing the character that we have as YMCA professionals and affiliates, others will be drawn in…bound to ask questions and engage in a conversation, simply because we truly care. And as we reach out to more people and show our real character, we’ll learn more about those around us. We’ll learn how to better help them, and how to connect them with the resources – and people – that are sure to enrich their lives. And soon enough, we’ll find ourselves facing people like Kevin on a regular basis, and we will feel confident that so-and-so is doing great…still living a happy, healthy life, thanks to the impact we made. Throughout high school and college, I attended the annual, 5 mile Manchester Road Race every Thanksgiving morning. As a student, I would go to the race with my friends, and then return home to eat myself into a turkey induced hibernation. I stopped running when I married and had children, but returned to my sport, about seven years ago. Once I had regained my stamina, I also returned to the Manchester Road Race…the best way to kick off my favorite holiday. There was a problem however, I went to the race alone. I love my husband and kids, but they are not runners. My husband likes to tell people that if they ever see him running, they should get out-of-the-way, because there is something chasing him! I didn’t like going to the race alone, but I had no choice. It’s a terrible feeling to be in the middle of 25,000 people and feel lonely. None of my friends were runners, and it’s hard to get anyone to come out and watch you in the cold, sad weather of deep November. I didn’t want to go by myself again. Well, thanks to the Y, I didn’t have to. I’ve been working at the Y for just over a year, and in that short time, we have created a running club that meets twice a week. It’s been such a pleasure watching a new community form: newbie, veterans, seniors, teenagers, moms, dads… We even had a race of our own: The First Annual Indian Valley Spooktacular 5K! For many, this was their first competitive race, and everyone leftlooking forward to next year. As the leaves began to fall, the standard question started to circle through our running community: “Are you running Manchester this year?” It was a challenge, but the memories of all the fun we have had through the summer, pushed several of us to plan a car pool and order matching shirts for the big race. I woke up bright and early this past Thanksgiving morning. Dressed in my stylish, new Indian Valley Family YMCA Running Club t-shirt, I warmed up the trusty mini-van and waited in the driveway for my Y family to arrive. And they did…first one car, then another. Thanks to my Y, I didn’t go it alone this year, I ran with my family! 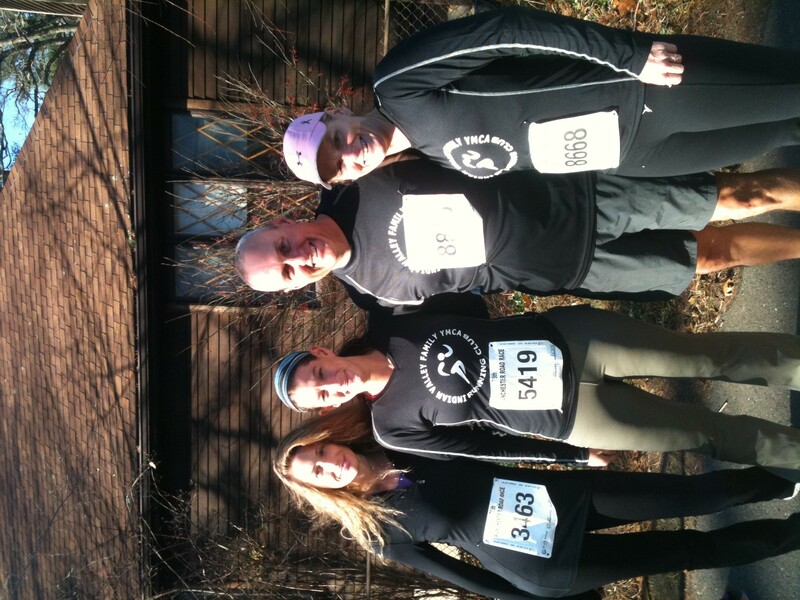 Robin, Alit, Dave and Heather at the 75th Annual Thanksgiving Day Manchester Road Race, 2011. Kendra joined the YMCA to lose weight. The Health & Wellness Director paired Kendra with a Certified Personal Trainer after reading Kendra’s registration information. During her first official workout, Kendra confided in her trainer, that she used to love practicing yoga, and thought it would be impossible to ever perform her favorite pose again…WHEEL. Wheel is a very challenging pose that requires not only a great of flexibility, but tremendous strength as well. Slowly but surely, the weight came off. Two pounds this week, one pound the next, and Kendra’s strength and endurance increased. The entire Wellness Staff became involved in Kendra’s progress, excited to watch her transformation before their eyes. It is common for trainers and clients to become close friends as they work together to reach the client’s goals, and this was no exception. Slowly, Kendra’s trainer started working yoga poses into their weekly workouts, with the intention of helping Kendra to regain her ability to practice the Wheel pose. Last week, something magical happened. After a hard workout that included kick boxing, wind sprints and strength training, Kendra found herself stretching out on the mat in the Wellness Room. Without hesitation, Kendra followed her trainer’s directions to move onto her back, place her hands backward behind her head, shift her weight into her heels and push with all her strength through her arms, into Wheel pose. Imagine Kendra’s surprise when she opened her eyes, facing upside down and backwards, to find herself face to face with her trainer! To date, Kendra has lost almost 30 lbs, runs 4+ miles at a time, can bench 55 lbs, keeps up with her young daughter….and can pop right up into Wheel! Teenage girl and Instructor hugging in Group X studio…PRICELESS! I visited the Y in August of this year and joined that day. The staff was friendly, personable and explained the number of options that are available to the membership, unbelievable! There was no hard sell, just a terrific walk through. From day one, I have been welcomed by all of the staff. From the minute I walk in, I am greeted with smiles from the receptionist area and wished a good day when I leave. I have joined many gyms over the years and always dropped out after the first month. This is different. The water aerobics is fantastic. Heather is one fantastic lady and a wonderful instructor. She makes this fun and works us hard. We are a combination of various age groups and Heather is always encouraging us to try a little harder. She is funny, she makes this fun, but make no mistake she knows what she is doing. We have a new water instructor by the name of Gina. Both Heather and Gina alternate and this offers us different water excersises. Then, there is the “Young At Heart”, aerobics for women my age. Danielle is truly wonderful. She makes us move and it doesn’t matter if some of us are uncoordinated, me. She tells us that as long as we are moving our bodies. The Y offers so many great options and so many family orientated activities that there is something for everyone. I have never been a “joiner” but this place has made me feel that I truly belong and I am surrounded by friends. It is truly wonderful. It felt that I am in a spa every time I go there. I cannot say enough great things about how beautiful it is and how truly fantastic the staff is. All of them are always willing to help. Lisa’s Reinhardt’s door, as well as Heather’s, are always open and they make themselves available to the membership. I have not heard on negative thing from the members. And that in itself is unusual. My advice, Join. You will not regret it. Joan shared with me that she lost her husband in 2009. She went into a state of depression. She wasn’t doing anything except laying around the house. She needed something in her life and decided to join the Y. After joining our facility and being around people she said the “Y has made a world of difference in her life”. She has connected with members and this has made a significant difference in her life. By the way, she said her Cholesterol level has dropped to 200 since being active at our facility. She say the “Y has done her wonders!”. Tabetha & Christopher Avtges joined us in February of last year. They are husband and wife and usually come into the facility together. Sometimes I see Chris later in the evening working out when he doesn’t have a chance to come in the morning with his wife. Chris was out of work when he started using our facility. They had plenty of time on their hands and decided to get in shape. Rather than stay home, they got busy and hit treadmills. Since joining our facility Christopher has lost 16 inches in his waist. His wife Tabetha has lost 8 inches! Between the two of them they have lost 180 lbs! They told me that the “Y has completely changed our lives”. They continued that “it has been a long time since we felt this great!”. Chris added that “the Y becomes addictive!”. Chris just recently saw his doctor and his cholesterol and blood sugar levels have all decrease. Chris is now off of all his medications! Oh, and Chris just recently got his old job back and happy to be employed again! Let the story telling begin. The YMCA of Greater Hartford blog page has been created so staff can share stories of impact and mission that are happening at their branches. I know our branches are doing a lot of great work and I look forward to reading about it on the “blog”! We continue to learn about the impact our LIVESTRONG at the YMCA program is having on the participants and about survivorship itself. Watch this great video to hear one survivor’s story about how the program has impacted her. My wife and I han experience with trying another health fitness center and found that there was more negative talk than positive talk. There was a bunch of negatives, such as prices of the different programs they had. There was a fee for everything in that place. If you wanted a trainer you would have to pay an extra fee. If you wanted to use a certain machine, it would cost you an extra fee. It was FEE FEE FEE! They had a very small swimming pool, no life guards, and very negative staffing. One thing they were good at is high pressure selling of the different programs and products. The only good thing they had,was clean locker rooms. We came back to the Y after a short departure. We left because we wanted to see if there were different choices out there, but we didn’t find this which is why we came back. We got a warm greeting from the staff, like we had never left in the first place. We also got a GREAT financial package. The Y believes in you and motivates you without the burden of money and allows you to just be yourself! The Y brings out the best of you and they bring the family attitude because they care! We are trying to find time in our busy schedule to workout in such a positive atmosphere. They encourage individual and family values. They welcome you with loving smiles and open arms. Our experience has always been fulfilling and worthwhile since we came back. Ever since we came back and on better routine we have lost some weight and we are happy that we may meet our goals we set for ourselves.